2013 Porsche Cayman prices and and specs | What Car? 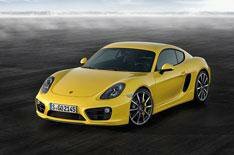 The 2013 Porsche Cayman has been revealed at the 2012 LA Auto Show. The all-new Cayman features sharper styling, revamped engines and improved performance compared with the previous-generation Porsche coupe. As with the outgoing Cayman, the new model is closely related to the Boxster roadster. The new car gets a longer wheelbase and shorter front and rear overhangs, and a new look all round. The sculpted line along the side door, more pronounced side air intake and redesigned headlights with four-point daylight running lights are the most notable changes. The rear has also been reshaped, with smaller rear lights, and a spoiler that stretches into the light clusters. As with the previous car, Porsche is offering two engines in the Cayman. The entry-level car gets the new 271bhp 2.7-litre six-cylinder petrol engine that also features in the latest Boxster. It completes the 0-62mph dash in 5.7 seconds in manual form, while choosing the PDK automatic gearbox brings this down to 5.6 seconds, while the Sport Chrono package reduces the sprint time to 5.4 seconds. The 321bhp 3.4-litre engine in the Cayman S is a revised version of the unit from the previous model, and takes 5.0 seconds to hit 62mph. The PDK-equipped version takes 4.9, while the Sport Chrono package shaves it down to 4.7 seconds. The Sport Chrono pack adds launch control and is expected to cost around 1085, or 1375 when the PDK 'box is fitted. The entry-level car gets 18-inch alloys, while the S comes with 19-inch versions. The standard equipment list includes air-conditioning, auto headlights, stop-start technology and a Sport button that provides more revs and a faster engine response. The options list contains extras such as a new top-spec Burmester stereo and adaptive cruise control. The new car is as much as 30kg lighter and up to 15% more efficient than the previous version. The 2.7 achieves average economy of 34.4mpg and CO2 emissions of 192g/km when fitted with a manual gearbox, and 36.7mpg and 180g/km with the PDK. The Cayman S offers 32.1mpg and 206g/km, and 35.3mpg and 188g/km with the dual-clutch auto 'box. The Cayman will cost from 39,694 for the basic car, and 48,783 for the Cayman S. Specifying the PDK gearbox is expected to add around 1920. Porsche is taking orders now, with first deliveries from March 2013.